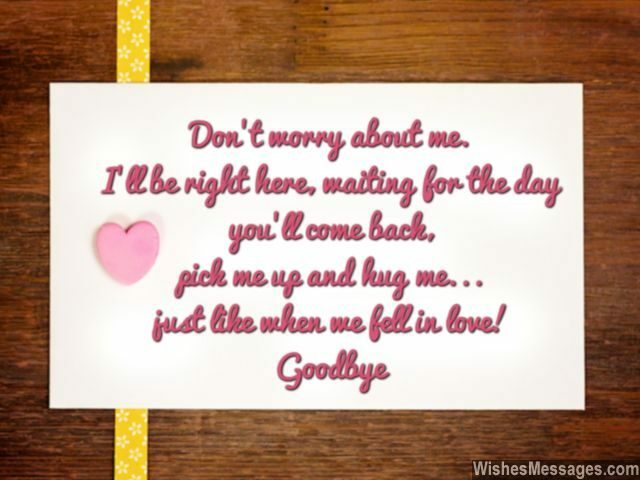 Goodbye Messages for Husband: Last hugs and farewell kisses should be taken to the next level with sweet quotes, cute little notes and romantic whispers. The memories of even the most fleeting goodbyes remain etched in the heart forever. Whether your hubby is flying out for a business trip, going overseas for deployment or moving to another city for work – make sure that you convey how lonely and miserable you’ll be without him. Let him know that his wife, kids and family will be waiting for him to come back soon. 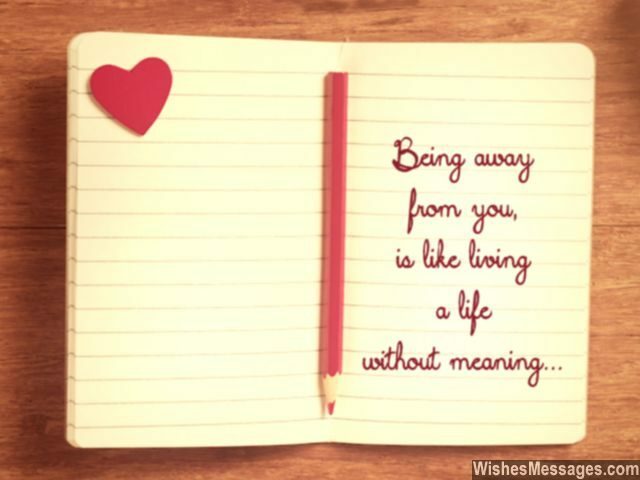 And while he is away, tag him on Facebook and Twitter in mushy posts. Use Pinterest to vent your loneliness and poke him with adorable texts when you miss him from the core. 1) No one can understand how I feel as I see you go. My anxiety and the impeding fear of loneliness, no one will know. 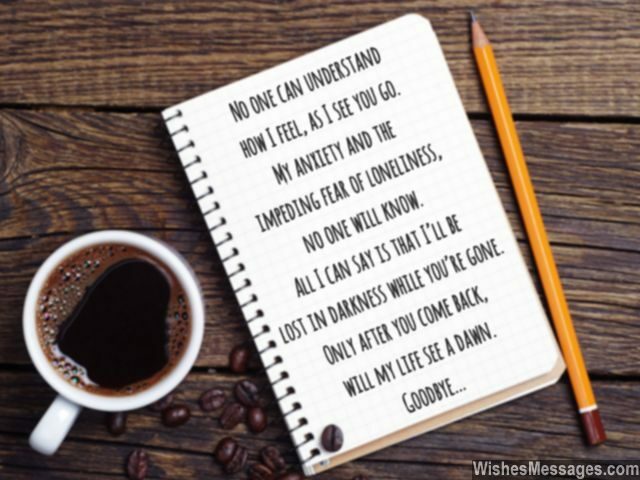 All I can say is that I’ll be lost in darkness while you’re gone. Only after you come back, will my life see a dawn. Goodbye. 2) The word goodbye occupies seven characters in a text, but limitless loneliness in my heart. Goodbye. 3) Loneliness is too shallow a word to describe the feeling a wife has when she misses her husband. It’s not as simple as missing someone special. It’s as complex as a watching dawn without sunshine, sleeping at night without darkness, listening to music without sound… and living a life without meaning. 4) Be prepared to pay for extra baggage when you travel. I can’t fit into your suitcase but I can surely fit into your heart. Goodbye. 5) Packing bags is not the tough part. Doing it for you, is what it shattering me from within. I will miss you, goodbye. 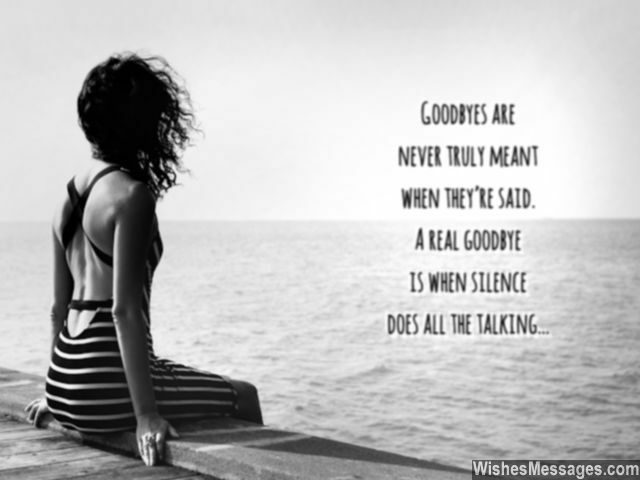 6) Goodbyes are never truly meant when they’re said. A real goodbye is when silence does all the talking. 7) I hope that the time we stay apart, is as short as the time it takes to say goodbye. Come back soon. 8) I don’t know what is more terrifying, the thought of our kids missing their dad, me missing my husband, the home missing its foundation or the family missing its hero. I’ll miss you, goodbye. 9) Distance does to love, what time does to memories. Sometimes it can make it stronger, sometimes it can make it fade away. 10) Missing you is a problem, to which even Google does not have an answer to. Come back soon. 13) As you leave, all I want to say is that regardless of how long the distance keeps us apart, I promise… that the memories will never fade away. Goodbye. 15) I think I will be down with the flu from the minute you leave to the moment you come back. The doctors will be unable to treat me because the only medicine to my illness will lie in the warmth of your hugs. Goodbye. 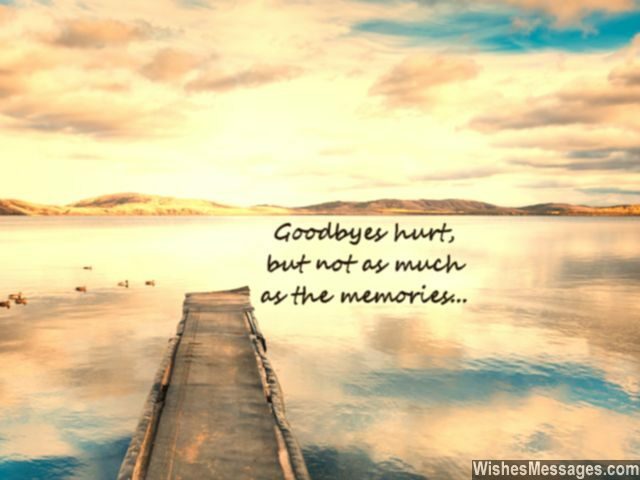 16) Goodbyes hurt, but not as much as the memories. I’ll miss you. 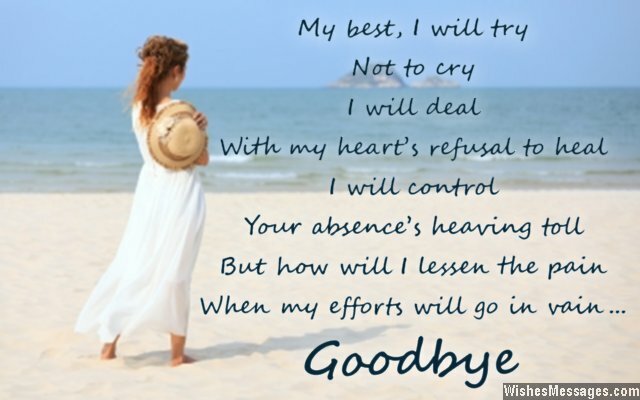 18) I don’t want to see you off, because I refuse to walk my heart walk away. Goodbye. 19) All these years together and I never realized that you’d become everything that I’d never want to say goodbye to. Come back soon. 21) Don’t worry about me. I’ll be right here waiting for the day you’ll come back, pick me up and hug me, just like when we fell in love. Goodbye. 22) The more beautiful the memories, the more they hurt. I had never thought that all the happy moments in our relationship would come back around to become by biggest weakness. Come back soon. 24) A thousand heartbreaking goodbyes and a million painful farewells will be contained in just one tear that drops from my eye when you leave. Goodbye. 26) I will miss you every single day. Your absence will shatter me in every possible way. Lonely and alone in the bed, I will lay. Please come back soon and drive my heartbreak away. Goodbye. 27) Just the thought of being away from my husband, my best friend, my life partner, my soul mate and my heart’s beat… is shattering me from within. Come back soon, goodbye. 28) Life with you, is like lying on a bed of roses. Without you, it is like swimming in a sea of thorns. Goodbye. 29) I can tolerate waking up to an empty bed, but I won’t be able to tolerate waking up to an empty heart. Goodbye. 31) When you are gone, I am not scared of losing you. 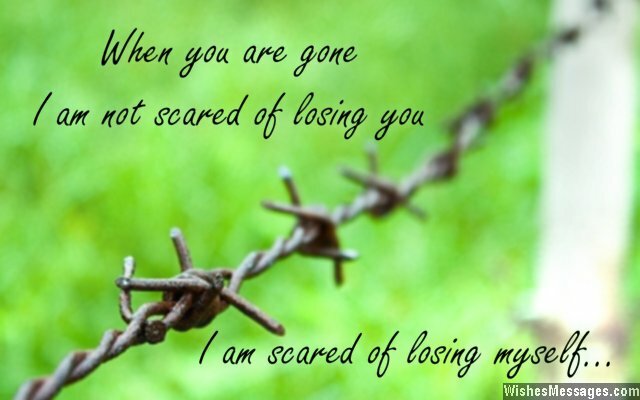 I am scared that I will lose myself. Goodbye. 32) Never before, has a travel itinerary aroused such intense emotions of anxiety in me. But since it is yours, it had to be. Goodbye. 33) Transient, temporary, momentary, impermanent, fleeting, brief, short-lived – these are the perfect words to describe our goodbyes. Come home soon, goodbye. 34) I understand, that work has be done. I know, life has to move on. I realize, bad times will pass. I recognize, the need of the hour. But no matter what, my heart refuses to accept that you’re going to be away. Goodbye. 35) No matter how many miles you are into your journey, don’t forget to miss your lonely wifey. I love you, goodbye. 36) My best I will try, not to cry. I will deal, with my heart’s refusal to heal. I will control, your absence’s heaving toll. But how will I lessen the pain, when all my efforts will go in vain. Goodbye. 37) My business trip may turn out great, but it won’t be awesome. It may turn out enjoyable, but it won’t be fun. It may turn out lovely, but it won’t be memorable. Dull and boring it will be, just because you won’t be there with me. Goodbye. 38) How do you expect me to say goodbye, when I don’t even want to spend a single second away from you? Come back soon. 40) The difference between just living and feeling alive, is the difference between life without you and with you. Goodbye.